Marcus is the crown prince of Heliopolis, a city on the mountain-tops, high above the cloud line. Returning from a diplomatic mission his father's aëro:cruiser malfunctions and sinks. No one has ever been below the clouds and survived, but Marcus is determined to find his father again, no matter what it takes. When I first picked this book up I was intrigued. 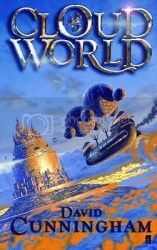 I’m always looking for new worlds to read about, and I’ve only seen a cloud world once before. I was not disappointed. Cunningham’s imagination seems endless and the cloudscape is a wonderful place to set it free. The setting is gorgeously painted, combining the new and amazingly imaginative with the little tweaks that you recognize so it isn’t completely foreign. It only took the first few pages to convince me that this was a place I wanted to visit (along with Hogwarts and Narnia – ain’t gonna happen, but a girl can dream, right?) It took me a bit longer to fall in love with the characters, but for good reason. At the beginning nearly every character is modeled on one archetype or another. With such a gorgeous, imaginative setting, it was quite disappointing to feel like I’d already read every single character a million times over. But, should you decide to read this one and begin to feel the same way, DO NOT give up. No one is who you think they are, I promise. You just have to give them a chance. Despite how much I want to rave on and on about how pretty this book is, that wasn’t even my favorite part. No, the best part about the book is, even with the beautiful setting and characters that grow into surprisingly different people, that’s not what it’s about. It’s about being open minded, learning new things and belief. Everything about the novel (including the fantasy elements) guide you towards his point and help it along. At this point, anyone who read my review of The Dragonfly Pool is probably grumbling under their breath about my inconsistency and hypocrisy. Let me explain. In The Dragonfly Pool everything obviously led to her conclusion, almost rubbing it in your face, and forcing you to agree with her. In CloudWorld everything guides you to his conclusion, but you must make the final conclusion yourself. Though his views on the subject are clear, he merely provides you with the information that will help you to draw a conclusion on the subject. If you choose, you could take an opposing opinion, or more likely take nothing from the book but an interesting story. This is what makes a well-written novel fabulous, and I am looking forward to finding the sequel!